Low profile platforms suitable for weighing trolleys, pallet trucks, etc. ; fitted with sideboards and an on/off ramp. Suitable for creating scales and electronic weighing systems for all types of industrial and commercial applications. Standard version is with approved load cell. Available also in the Ex II 2GD IIC ATEX version in stainless steel. Fitted with 4 IP68 stainless steel shear-beam OIML R60 approved load cells each with 350 Ohm input resistance. Structure and mechanics in AISI304 stainless steel. Adjustable, shock-proof jointed feet and level. Hermetic junction box, IP67 wiring with screened 5m long 6-pin cable with connectors for connection to the indicator. Fitted with one on/off ramp. Connection to the indicator and calibration with CE-M 3000e single range or 3000e + 3000e dual range approval (depending on the indicators used). High resolution model for internal factory use. JB4QAP: ATEX certified junction box. 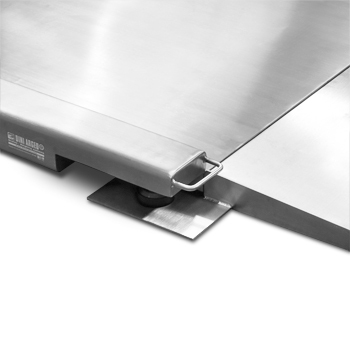 LPERI-1 Second on/off stainless steel ramp, 1250x600mm. 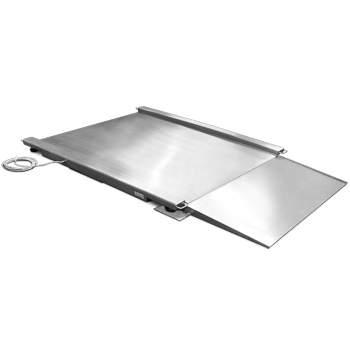 LPFRI-1 Second on/off stainless steel ramp, 1500x600mm. JB4QAP Equalisation box for pallet-weighing scales for hazardous areas. Protection modes: ATEX II 2G Ex ib IIC T6 Gb for gases, ATEX II 2D Ex tb IIIC T115°C Db IP65 for dusts. Complete with manual and ATEX CE CONFORMITY DECLARATIONS (available in EN, DE, FR and IT).